Our next course starts ,in September 2015 and will be run one Saturday a month between 10am and 4pm. It will be run over an academic year from September to July and the cost will be £30 for each session. Plus an initial payment of £90 which includes registration, manual, and probationer insurance. If you are interested in this workshop Click Here to book your place. On successful completion the student will be awarded with a diploma issued by the Holistic Healing College which enables them to practice on the general public. This course starts in September. 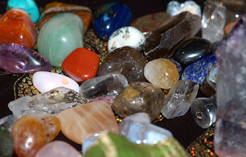 It is designed to enhance the work of therapists already using Crystal Healing as part of their range of therapies. However, it will also be of interest to anyone who has a love of crystals and would like to expand their knowledge for personal and family use. This course is run over an academic year from September to July. There is a cost for eac sessions and an intitial cost of £90 which includes manual, registration and probationer insurance.